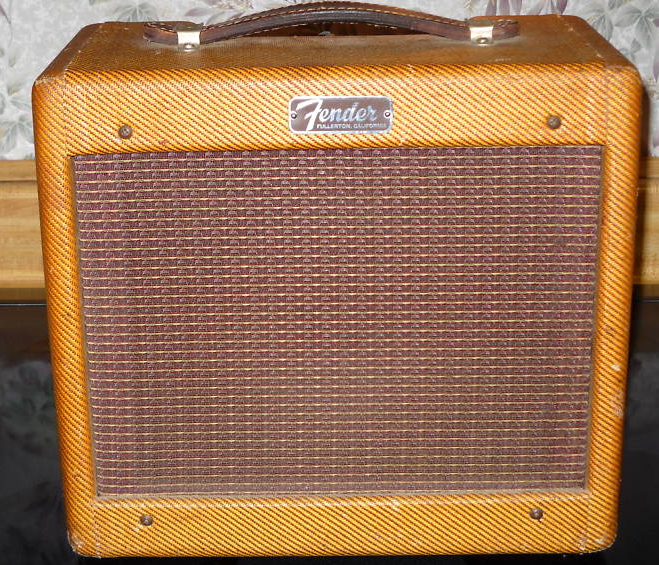 The great vintage tweed Fender Champs keep coming! Another great example of a vintage amp. We can get an idea of this amp’s age by looking at its serial number. C-10805 tells us that this amp was made sometime in 1959. Taking a look at the date code stamped on the tube chart we can see that it is stamped with IK which means this amp was made in November of 1959. We also have a nice clear picture of the code on the speaker 465 – 939. The first 3 digits tell us the manufacturer (Oxford) and the next digit is the year (1959) and the final two are the week. The 39th week of 1959 was the last full week of September. So this speaker was made about a month or so before the amp was assembled. Not too shabby of an amateur sleuth job! An interesting tidbit is the strip of masking tape with what appears to be the name Margaret written in pencil. I’m familiar with Lupe Lopez (there is a great photo of her assembling Champs on page 17 of Fender Amps The First Fifty Years by Teague and Sprung), but not Margaret. Any guesses? Own a tweed Fender Champ? Want to share photos of it with the world? We’d love to hear from you, drop us a line with the form below.